The TRIANGLE symbolizes the Blessed Trinity, Father, Son and Holy Spirit who take humanity as their Spouse in heaven. As Adam said of Eve ‘Flesh of my flesh and bone of my bone’ so does the Father say of us in Christ, ‘Soul of my soul and spirit of my Spirit.’ This beatific vision and participation in Its intimate life of love and glory, ecstasy and joy, is the goal of our existence. Humanity is the Bride of the Lamb call to his marriage feast. JESUS is symbolized by his most Sacred Heart burning with love on the great sign of His love, the cross and the Holy Eucharist: just as his heart is filled with overflowing flames so are we to have the Holy Spirit filling and overflowing our hearts in love for God and love for neighbor. The HOLY EUCHARIST is the heart of Jesus and the actual direct link for us into all the mysteries and states of the life of Jesus on earth as given to us throughout the year in the liturgical calendar, and the graces of each state are renewed in us for each individual feast day together with his virtues. The symbol for JESUS is one of three symbols that are placed at the nearest point to the angles of the triangle to form the MOST HOLY FAMILY whose relationship to Jesus on earth we are to emulate and whose relationship to the most Holy Trinity we are to live. And we are to love each of them as the Most Holy Trinity relates to each one of them. The STAR with the twelve smaller stars symbolizes the HOLY VIRGIN MARY. The large star may also be taken as a symbol of the individual soul in union with Mary who assists it in the most direct flight into God. Mary in Holy Scripture has the twelve stars in Revelation revealing that she ‘the woman in travail’ is bringing Christ forth in us as our Mother together with the Holy Spirit and we in turn bring Him forth in others. The LILY symbolizes ST. JOSEPH. Joseph as patron of the Universal Church is the protector of the Soul on its journey into holiness and we in turn, with him, protect, nurture and foster the Divine Vocations as he did for the Child Jesus. The Vocationist Fathers and Sisters foster and raise those with Divine Vocations and are thus Mary and Joseph to them, but it is a vocation we all share since we too must nurture Jesus in every person we meet. The MYSTICAL BODY OF CHRIST is symbolized by the interlinking circles: the CHURCH MILITANT (on earth), the CHURCH SUFFERING (in purgatory), and the CHURCH TRIUMPHANT (in heaven). We are in union as of One Mystical Body with those in heaven whom we pray to and make our petitions to; we are in union with the souls in purgatory for whom we pray and who pray for us. We are in union in Christ with the Church on earth and our growth in Holiness affects all of them: that latter fact is the basis for the priestly victimhood and life of contemplatives. Our sin can affect all also for ‘if one member suffers all the rest suffer with it.’ These three circles are also the symbol of the individual’s journey into God through the purgative way, (purification: purgatory – church suffering); the illuminative way (church doctrines, teachings of faith – church militant), and the Unitive way (holiness and divine union – church Triumphant). 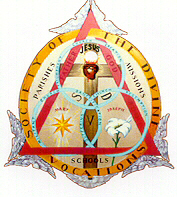 The SOCIETY OF DIVINE VOCATIONS encircles all to reveal it contains all the aspects within itself which it wishes to communicate through working in parishes, missions and schools. The personal holiness and sanctity of the individual will, as it grows deeper, enable the Vocationist to be a communicator of the means and graces of Holiness to other as Mary does, as the angels do – so will we do for one another. Moreover, the Society fosters vocations for every Order in the Church and so in itself is a synthesis of them all. Every contemplative soul encapsulates all orders having stepped into the pure light of God of which all Orders are the prism. The HOLY ARCHANGELS are over all, protecting and helping to bring all to Divine Union: bringing each soul the graces from God that come through Mary to us – the angels are interacting ceaselessly in all the levels through which we ascend into Divine Union and on all the levels of the Church. Fr. Musella, Salvatore, SDV and Sr. Woods, Anne. Apostle of Vocations: Blessed Justin Russolillo. Copyright, May 2011. Vocationist Fathers. Holywell, UK.